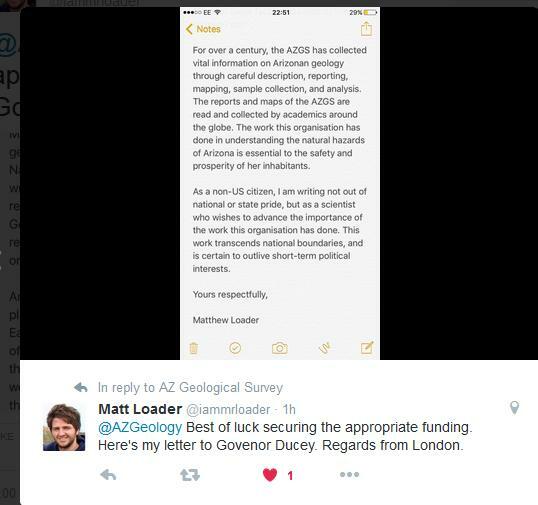 Geologists and geology advocates are making their opinions known about Arizona Gov. 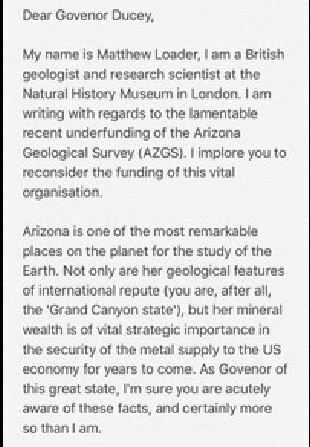 Doug Ducey's government consolidation decision to defund the Arizona Geological Survey as of June 30. 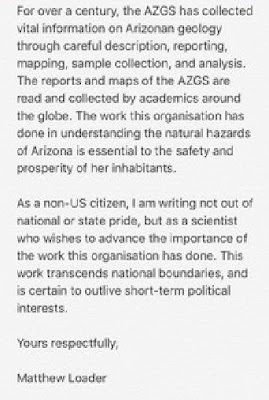 The AZGS duties have been handed over to the University of Arizona, which is providing partial funding for one year while the Survey is expected to become fully self supporting from grants and fees for services.Our colleagues and complete strangers are forwarding letters, blog posts, and published articles that they wrote or discovered..
Scientific American blogger Dana Hunter posted a piece on the SciAm blog Rosetta Stone, entitled, "Help Save the Arizona Geological Survey," with the subtitle "The Arizona Geological Survey's budget has been slashed by the state's short-sighted government. There are as many reasons to save the agency as there are geologic wonders, riches and hazards in Arizona. Let the governor know that the AZGS must be fully funded! In this article I'll tell you why it's so important." 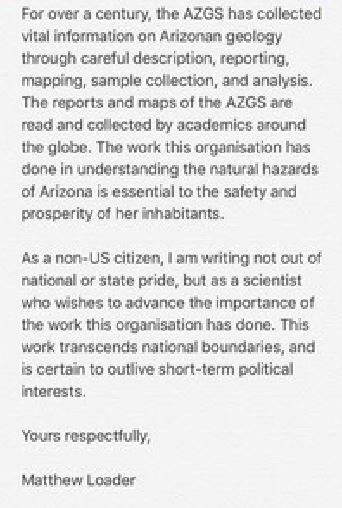 She describes the geologic hazards we face in Arizona, that are part of AZGS's duties to identify and mitigate, including volcanoes, landslides, earth fissures, floods, debris flows, earthquakes, radon hot spots, and arsenic in groundwater. I don't know Dana, but she describes herself as a "science blogger, SF writer, and geology addict." 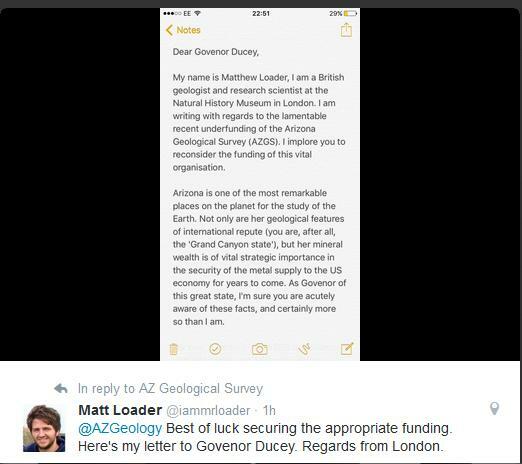 Matthew Loader, a geologist from the Natural History Museum in London, copied us today on a letter [right] he sent to Gov. 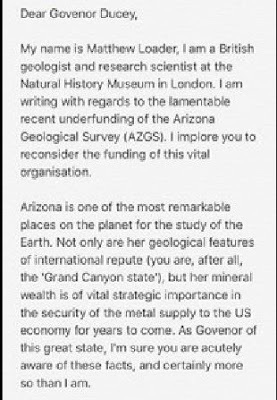 Ducey, in which he notes that Arizona's "mineral wealth is of vital strategic importance in the security of the metal supply to the US economy for years to come." Was the AZGS/UA consolidation driven by cost cutting as many are assuming, or simply by an executive branch desire to simplify the Governor's organizational chart? If cost cutting was the motive, then how can continued funding (many times the AZGS budget) for the Arizona Historical Society be explained? Any valid cost benefit analysis would have given the AZGS budget a higher priority. Yeah we would have thought exactly that wouldn't you think? This is absolutely mishandled and the public citizenry has been ill served. In other words....this is shameful.